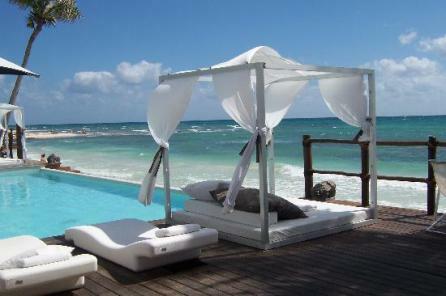 Blucacao Beach Club is located in the heart of Playa del Carmen. This beach club is very upscale and the amenities are awesome! This intimate beach club is not crowded and is smaller than Mamita's and Kool. Blucacao has 2 swimming pools side by side and lined with cusioned loungers. The pools are shallow and perfect for cooling off while holding your drink. The beach is just beautiful and perfect! The beach has cushioned beds and lounge chairs to rent. The sand is sugary white and the ocean perfect for swimming! This beach club offers an upscale restaurant with top notch food and drinks. You can get anything from cheeseburgers to shrimp, sushi, pasta and chicken. Renowned chef Cupertino Ortiz is the one responsible for these delicious bites! Blucacao is open to the public and prices avg. 90 pesos per drink, anywhere from 50-300 pesos for chairs and beds per day. If you are staying at the Luna Blue Hotel you are able to enjoy these benefits for free!